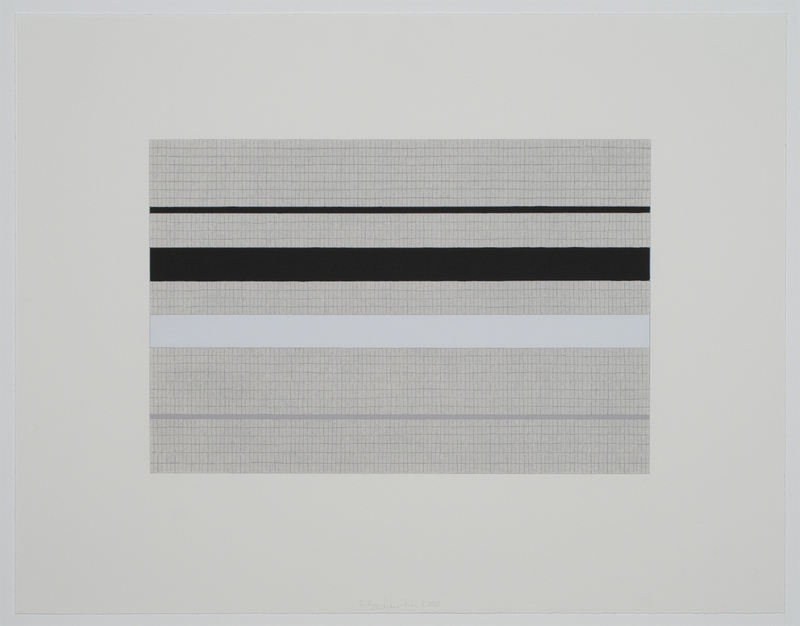 Rachel Nackman: How did the Laid Line drawings develop? Karen Schiff: The Laid Line drawings came out of my concern about being able to relate directly to the physical world. Before I started this series, I was making rubbings of floors, getting a sense of a texture that isn’t immediately available to the eye. The Laid Line drawings were an attempt to get at the texture of paper, which one also can’t necessarily see. But I knew that I couldn’t just rub my pencil over the surface of a sheet of paper and make that texture visible. I had to articulate it more closely. Both the rubbings and the Laid Line drawings perhaps grew out of my practice of meditation. A lot of people think that meditation is about going somewhere in your head—a nice beach or some fantasyland. But my experience of meditation is that it’s simply and literally a practice of being in touch with what’s actually happening and with the world that’s around us. And it’s “practice” for doing that all the time. The techniques that I use in my drawings are material ways of bringing that practice into my art making. RN: So you’re trying to “get in touch” with the paper, to enhance your own understanding of its character? KS: Yes, I want to “understand” the paper but through the senses. And I want to give that sensory experience to the viewer as well. Paper is the underlying substrate of so many drawings. In the Laid Line drawings, the physical object is highlighted. The drawings invite viewers to have a visceral experience of what is immediately in front of them. 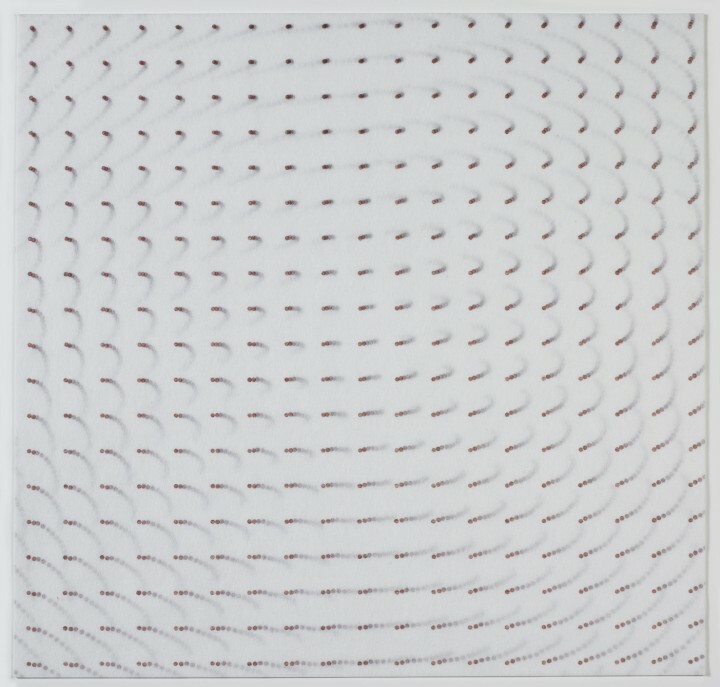 RN: Does the drawing act as a scrim over this object: a screen through which you hope people will see the paper in a different way? KS: It is a scrim—in the sense that I’m layering graphite over the paper. But I actually want that layer to act as more of a conduit. I want to lift a veil between the viewer and the object. Wynn Kramarsky: Clarifying is probably a good word for that. KS: Yes. I highlight or articulate the paper, clarifying our view of what we can’t so easily see. WHK: For a fairly general audience, I think it might be good to distinguish between laid and wove paper. KS: Sure. The laid paper I’m working with is made on a mold, with a mesh of very fine wire ribs. The resulting paper is embedded with a perpendicular grid that looks like books on bookshelves. That laid texture intrigues me—maybe because it reminds me of Agnes Martin’s grids but also because it’s a clearer texture than you can see in wove paper. Papermaking molds for wove paper have a very dense, interlocking wire structure, which results in a more uniform, allover texture. RN: When you make other drawings, do you work primarily with laid or wove paper? RN: When did you make your first Laid Line drawing? KS: It was in 2006, when I was on a residency at Jentel in Sheridan, Wyoming. The drawing in this exhibition is from the pad of paper on which I first started tracing the Laid Lines. I had the idea maybe a year earlier, and as with lots of my ideas, it sprang fully formed into my head, but I let it simmer for a while. In this case it finally reemerged because I found this particular pad of paper—and I make Laid Line drawings only on paper that speaks to me in some way. If the paper is materially intriguing, then I want to work with it, to bring attention to whatever it is about it that I find qualitatively interesting. RN: Why was this particular pad of laid paper intriguing to you? KS: It had nice proportions—I liked the seventeen-by-fourteen-inch size. It had a good color, a good weight. For those reasons, I bought it, but when I got back to the studio and looked at it more closely, I realized that there were all kinds of anomalies in this paper that made it even more interesting. The columns in this main space of the paper—they’re called chain lines—are not always evenly spaced. Sometimes they’re bending or curving! That’s what intrigues me so much about this project. When I engage with real paper, it’s not ever what I expect. My goal is to bring out those anomalies. I should say also that this is machine-made paper. I use only machined papers in the Laid Line drawings; I don’t use handmade papers. I have a sense that daily, seemingly boring materials are actually quite unusual the more you look at them. These machine-made papers, which try to be so regular in their manufacture, actually contain surprising details. The more we look at our daily surroundings, the more surprised we might be. I want to show the human quality in machined material. That human quality comes out of the paper—not only in the bending chain lines, but whenever I clarify or articulate these details, my hand also makes mistakes. Variations come from me as well as from the machine. RN: By applying graphite to the paper, you bring all these imperfections to the surface. KS: Yes. I use only tools that will respond to my hand—graphite, ink—but applied with a brush or a dip pen so that there is variation in the mark. RN: How do you decide where on the page you’re going to begin drawing? KS: I hold the paper up to the light and examine it. What I’m looking for are the places where there are bends in the chain lines, where the widest and narrowest columns are. . . . This particular pad of paper had an anomalous horizontal seam that fell at a different place on each sheet—an extra bit of raised texture. In this drawing, I found where that horizontal seam fell within the field of the sheet, and I used that to determine the location of the top edges of these two columns. RN: Is that sort of decision based in any additional way on the formal composition that you’d like to develop? Or are your choices based entirely on the conditions of the material? KS: It’s some of both. In this drawing, the dark column is the narrowest column in the whole field, and the lighter column is the widest column in the whole field. I was really interested to see what it would look like to make a drawing of just those anomalous columns. When I make drawings in which more standard columns are involved, I annotate those columns in a medium gray, in terms of the density of the graphite. I decided that if I were to squeeze the graphite—to fit into the narrower column—it would get denser and therefore darker. And if I stretched it out like taffy—to fill the wider column—it would get lighter. That was my color-coding key for this series. RN: Do you feel that it’s important for a viewer to understand what you are doing on each page, why your marks are arrayed in a certain way? KS: I think that each drawing—if it’s working—has its own life. I don’t need to say anything about it. Ideally, if somebody looks at it long enough or hard enough, the source for the marks will reveal itself. WHK: That assumes that people know enough about paper to begin with. KS: In a way, I don’t assume that people know anything about paper. WHK: Do you hope that your drawings will teach them something? KS: Yes, or bring them to appreciate the paper visually, even if they don’t know how those creases are made. WHK: It’s a leap of faith. RN: What do you think about while doing the repetitive work involved in a Laid Line drawing? KS: I’m thinking both of keeping track of where I am and of anything else that happens to be in my head. I hope that the process reveals not only the actuality of the paper but also the moment-by-moment engagement of my hand. Paul Klee used to say that drawing is taking a line for a walk, but when I make these lines, I feel like I’m walking hand in hand with the line. When you’re walking with somebody, holding hands, you are aware of holding hands with that person, but your mind can be anywhere. If I’m too fixated on these lines, the whole process feels so tight that I get exhausted, and I think that the drawing suffers as a result. If I’m too loose with my attention, I’ll go beyond the margin, or I’ll otherwise lose track of where I am on the paper. I need to have my mind somewhere in between paying attention to the physical act and not paying too close attention. It’s like a light touch—an awareness with an aerated quality. RN: Is this a frame of mind that you enjoy? KS: Yes. It’s relaxing, both because I enjoy working with the paper and because it’s a frame of mind that feels generous toward my own thoughts, which could involve anything. RN: These drawings do so much to clarify and annotate your materials, but are they ever about you? KS: I was just thinking about the word clarifying and how it relates to butter. When you clarify butter, you separate out the parts, but also it becomes much more rich, and it tastes good. That’s something about me that I hope comes through in these drawings: an expression of my appreciation for these materials. Even though the genesis of these drawings is conceptual, they also come from a deep love of material that I hope people will pick up. WHK: I think any good drawing is a self-portrait. Maybe it’s totally abstract, but it is an expression of whatever that artist is trying to communicate. It is very important that you’re a part of this, intrinsically, because without that involvement, the drawing would not exist. WHK: It’s interesting that, even with that kind of concern for the material, you decided to use machine-made paper rather than handmade paper. For many people, the idea of paper being handmade is very important, and they want to communicate that. Your approach is more twenty-first-century. KS: Yes. Well, I’m not just concerned with this piece of paper. I’m concerned with the world to which it belongs. If it’s handmade, then the world that it belongs to feels almost hermetically sealed—enclosed in craft. This paper does belong more to the twenty-first century. RN: While you were beginning this series, you were also conducting research on contemporary music. I imagine that as you make each drawing you develop a rhythm of making that drawing. KS: Yes. That’s so true. The tool changes the rhythm, and it develops into a way of spending time or thinking about time. KS: Yes, literally. That’s another way I think about these drawings: each of these lines is a separate moment. Each is like a character in a language that we don’t yet understand. Each character is unique, even though it’s the same type of mark. RN: You’ve said that perhaps what attracted you to laid paper was its reference, in your mind, to Agnes Martin’s work. 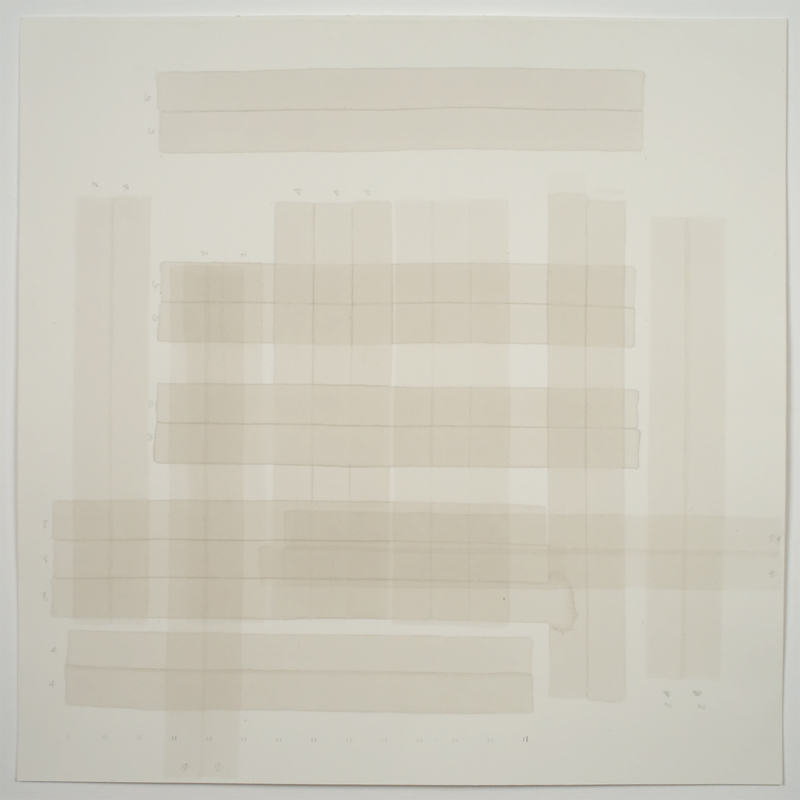 Agnes Martin has been very important to you throughout your practice. 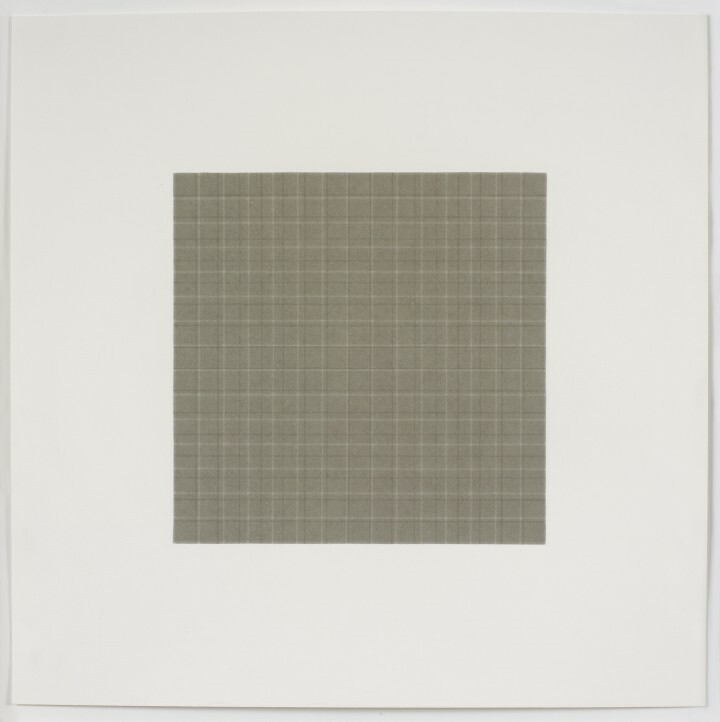 KS: For me, Agnes Martin is a model of rigor and of honoring a certain aesthetic standard and work habit. Her works exhibit a mixture of a human touch and a regular, quasi-mathematical sense of proportion. My Laid Line drawings are gridded, as much of her work is gridded, but the sources for our grids are completely different. She would have a feeling, an “inspiration,” and she would wait until she could envision whatever geometry was going to make manifest that particular feeling. This was a romantic activity, and in a way I’m a romantic too. But my romance is with something very real-world. I look to material reality for my inspiration. It’s my contact with reality that inspires the work. Play to hear Karen Schiff discussing awareness and intention in her work. Karen Schiff (b. 1967, New Haven, CT) earned her BA in Comparative Literature and her MA in English from Brown University in Providence, Rhode Island (1989). From the University of Pennsylvania, in Philadelphia, she received her PhD in Comparative Literature and Literary Theory (1998). Schiff completed her MFA in Studio Art at the School of the Museum of Fine Arts / Tufts University, Boston (2006). She won a Drawing Award from the School of the Museum of Fine Arts, Boston in 2005. 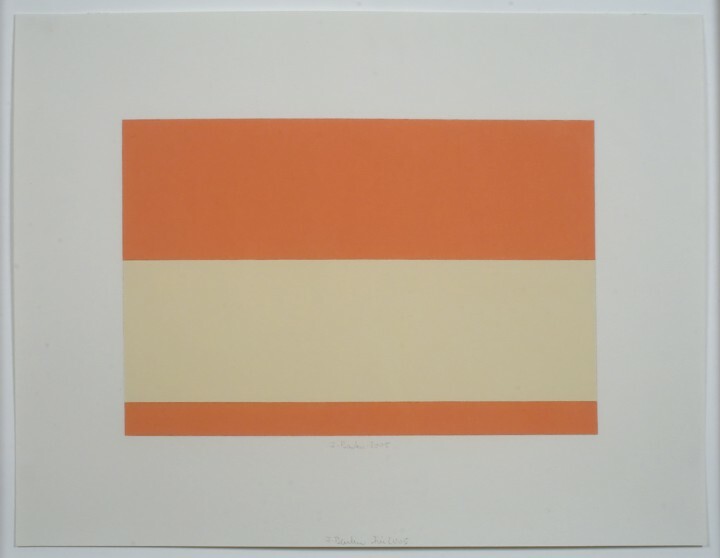 Schiff has been resident at the Vermont Studio Center, Johnson, Vermont (2004); the Jentel Arts Foundation, Sheridan, Wyoming (2006); the Harwood Museum of Art, Taos, New Mexico (2007); the Edward F. Albee Foundation, Montauk, New York (2007); the Wesley Theological Seminary, Washington, D.C. (2008); Anderson Ranch, Snowmass Village, Colorado (2011); Yaddo, Saratoga Springs, New York (2012); Wurlitzer Foundation, Taos, New Mexico (2012) . In 2010, Schiff spoke on two panels about book arts criticism at the Contemporary Artists’ Books Conference, MoMA / PS1 Contemporary Art Center, Queens, New York, and in 2012, she spoke about her work to a symposium of medievalist art historians at the University of Chicago’s Special Collections Library. Recent solo exhibitions have been held at Danese Gallery, New York (2010); the Flanagan Campus Gallery, Community College of Rhode Island, London, Rhode Island (2011); and Diane Birdsall Gallery, Old Lyme, Conneticut (2011). Schiff’s work has been included in numerous group exhibitions, most recently at such venues as Björn Ressle Gallery, New York (2008); the Mills Gallery, Boston Center for the Arts, Massachusetts (2009); the Museo de Arte Contemporáneo Esteban Vicente, Segovia, Spain (2009); Galería Astarté, Madrid (2010); Danese Gallery, New York (2010, 2011, 2012); the Katonah Museum of Art, New York (2011, 2012); dm contemporary project room, New York (2011, 2012); Kentler International Drawing Space, Brooklyn, New York (2011, 2012); and Arkansas Arts Center, Little Rock, Arkansas (2012). Schiff lives in New York City; her studio is in Brooklyn. More information about her work can be found at www.karen-schiff.com. 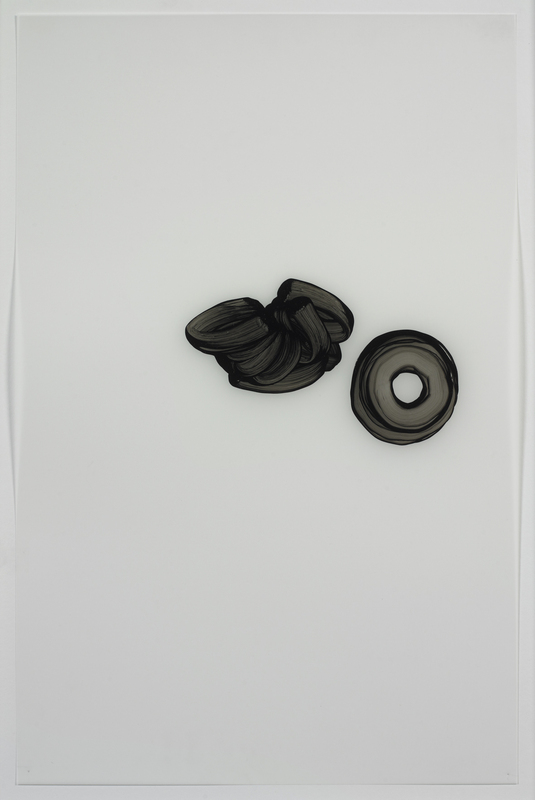 Rachel Nackman: Can you tell us about the rhythm of making one of your drawings? Nicole Fein: Slowing down is fundamental to what I do. I use processes that are technical, but the essence of the work is not the technique—it’s the process of slowing down and building something in a step-by-step, iterative manner. That is my approach to every day. The slowing down comes from the very simple rituals of cutting the paper, setting it up, and doing tests on the test sheets. All those rituals bring me to a place from which I can make that first line. Wynn Kramarsky: In making the initial decision to make a drawing, a particular drawing, do you think, “It’s nine o’clock on a Tuesday, and I have to make a drawing”? Or do you think, “I have to make a drawing, even though it’s nine o’clock on a Tuesday.” How disciplined are you? And how much of your work occurs because you suddenly feel that you must produce something? NF: There’s a pressure that comes and goes—but it is like going to work. When it’s time to work, I am disciplined about bringing myself to that place. NF: Yes, it’s both a discipline and a calling. Sometimes I can’t resist, like the times when I go downstairs to the studio—just to close up for the night—and something catches my eye, and before I know it, hours have passed and it is three in the morning. RN: How long does it take you to make one of these drawings? NF: The finished piece is ideally made in one sitting, but I make so many failed attempts that I don’t know whether to count those in the process of making one work—especially when I’ll complete one and it’s still not right. RN: It could take anywhere from one sitting to several weeks of work to complete one drawing? NF: Yes. And a sitting can last anywhere from a few hours to all day. The longest was fourteen hours straight. RN: Can you tell us about the physical process of making each drawing? NF: I can describe, first of all, the setup. My good friend Ed Green made me a beautiful large worktable. On the worktable is an adjustable easel. I used to draw bent over at a flat table, and it was really hard on my back and shoulders. I wanted to be upright. The easel that Ed designed allows me to turn the paper upside down to draw from both directions while also keeping the line I’m making at eye level. I start at the upper left-hand corner and move the brush from left to right, turn the board and the drawing upside down, and then go back over that line again, moving across the paper. A Velcro system allows me to adjust the height of the paper after every stroke. Through repetition, I get into a rhythm of drawing. But still, after many hours, standing or even sitting upright…I get tense and tired. RN: Do you take breaks? NF: I try not to take breaks. It’s best for the work that way. On a very intensive day, I won’t talk to anyone. I won’t eat very much. I try to avoid having to take a bathroom break. It’s rigorous. RN: Do you have to prepare yourself in advance for that sort of endurance test? RN: That’s when you approach the discipline that Wynn was talking about. NF: Yes. Mentally it does require focus and patience, and I’ve often been asked whether it feels like a meditative process. I’ve never done strict meditation, but doing this kind of work requires absolute presence of mind, attention, and focus on the line at that moment. It does not leave me feeling refreshed at the end of the day. I feel completely depleted and exhausted. It’s not rejuvenating, as maybe meditation is. One important thing to me, however, is that I do not want the drawings to feel labored over even though they are labored over. I want them to have a real sense of peace and calm, and I want them to simply appear on the paper. WHK: When you finish a drawing and you decide, “Yes, this is a good one,” does that give you the kind of serenity that most of us experience when looking at your work? The next day it does look better, and the day after that it looks even better, and a week later maybe I can start to feel that sense of calm from it…. I’m learning to trust the process, to keep going even if it doesn’t seem like it’s going well. At its best, the practice brings calm. RN: When you’re making a drawing, are you conscious of certain things that you need to do in order for it to turn out well? NF: Absolutely. One of my long-running conflicts with myself is about trying to make a perfectly straight line. There’s some comfort in trying to maintain a straight line, but when I look at work that I’ve done, it’s the ones that aren’t so perfectly straight that I like most. Even though at the time, it seems like, “Oh no, I’m messing up!” Those pieces have a life…a feel that makes them more interesting for me, even though in the making it’s a challenge to allow myself to let go. The untitled test sheet from 2009 (fig. 2) is very special because it captures one of those magical moments in the studio of discovering something unexpected. On a test sheet, I’m testing color, but I’m also testing line, figuring out how many passes I need to make in order to achieve the effect I want. Here I wasn’t paying close attention to how I laid down the lines; they overlapped, and I suddenly saw two different patterns coming together. Before that moment, it had never occurred to me to put one pattern on top of another. That idea opened up a whole new world of possibilities. The results were always surprising—more interesting than anything I could have deliberately planned. For the first time in my work, there was movement and rhythm. Before, everything had been very still. I used the same idea to make 1042809, also from 2009 (fig. 1). In this drawing, the overlapping patterns ended up creating a central square, which was very exciting. I didn’t know that would happen when I was making the test sheet; as I was drawing, I could see it emerging. RN: How many studies do you make before you begin working on a finished drawing? NF: It’s usually one or two. RN: Do you sit down to make a study with the idea that you’re going to make a specific drawing based on that study? NF: Yes. But again they’re very sketchy. I don’t know what the drawing is really going to be like, even though I’ve figured out the spacing and the overlapping on the test sheet. I still don’t know what the final outcome will be. RN: Once you’ve made a study, do you keep it by you while you’re making the drawing? NF: I make a test sheet to understand the patterns I want to use, and then I use those studies to apply guiding marks to the larger drawing paper. Those marks are removed once the work is complete. But I don’t refer directly to the study once I’ve started working. At that point, my total focus is on the line of the moment. RN: Is the pattern that you devise before making each drawing a way of being decisive in advance, so that then you can be focused without having to make decisions? RN: What do you find challenging about making these drawings? NF: There’s really no room for error in my process, so a good drawing is rare. I have to try not to get discouraged, because so many of them don’t come out right. I just have to start over. RN: It’s an apt metaphor for daily life. RN: Can you tell us about how you came up with the idea for Coriolis (2010; fig. 4)? NF: Yes, I would love to tell you. Because there were so many woven patterns in the watercolors I was making around that time, I started thinking about textiles and decided to learn how to sew. One day I went to the fabric store with a tunic that I wanted to copy. The woman there gave me what she said was patternmaking material, and I spent that weekend on my hands and knees in the studio, trying to draw a pattern. The patternmaking material was covered in red dots—a dot matrix. I was surrounded by dots, and the material was semitransparent, so the dots were coming in and out and all around me…. I quickly lost interest in the idea of trying to make something to wear. I thought: “This is great material. I should do something with this.” I started to play with layering it. I thought: “This is preprinted material! It’ll save so much time.” Well, I quickly realized that it’s mass-produced, so the dots aren’t printed perfectly. WHK: The register is bad. NF: The register is bad, and in order to align them on top of each other…it just wasn’t going to work. I realized I would have to draw all my own dots. [Sigh.] Which is of course so much more true to my nature and way of doing things. I started searching for the right material to use, and as has happened countless times over the years, Ed Green arrived at my studio with a roll of Holotex, which is a polyester material. Ed also made me some wooden drawing tools, which I used to stamp the ink onto the Holotex. I would apply color to the tool and then stamp it down to make each dot. I started to play with the arrangement of the Holotex sheets, and I kept thinking, “How am I going to hold these sheets together?” I wanted to stick them together, but I didn’t want the adhesive to show. I realized that I had only the space of the dots under which to hide adhesive, so I made a double-sided tape dot for every single drawn dot, using a Japanese screw punch. Play to hear Nicole Phungrasamee Fein speaking about the discovery of her work Coriolis. The original idea for Coriolis was that the dots would rotate around the center. That was what I wanted to see happen. I had arrayed all of my sheets after months of preparation, with the dots and all the tape on them. One day, when I thought I was ready to remove the release paper from the double-stick tape and actually adhere all of it, I started to move the stack, and the sheets slipped from my fingers. They arrayed themselves into Coriolis by chance. I was stunned—in awe and just silent. I couldn’t move. I stood there looking at this pattern; I didn’t know what it was, and I didn’t understand it. I quietly tiptoed upstairs and whispered to Mark and [my son,] Felix: “Something just happened in the studio. You have to come and see.” We looked at it together, and we didn’t understand what it was, but it was far more interesting than what I had been planning to do. For days, I stood and looked at it. I studied it and tried to figure it out, tried to understand it enough to intentionally do it. Yet I only had those sheets prepared to work with, so one by one, I started removing them to remake Coriolis. WHK: That’s amazing, because you probably had a fairly square original pattern for it. NF: Yes, my plan was perfectly symmetrical and very predictable. In Coriolis, there’s no center of gravity. There’s no single point around which the dots rotate. Some recede and some come forward. RN: They array themselves within a very three-dimensional space. RN: There’s a meditative and infinite feeling to looking down into Coriolis that references, in a lot of ways, your watercolors—but in a more dimensional way. RN: Is your work a sort of diaristic exercise? NF: Yes, it is. The title of each work is the date of its completion—just a way of marking for myself at what point in my life I made each one. While the test sheets are notations for formal drawings, all the works are notations for my life. 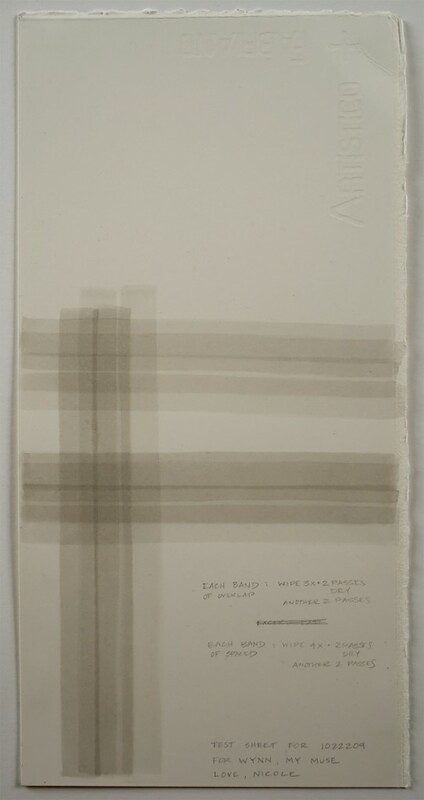 The finished works show something about my state of being on a particular day; the individual lines record the moments. RN: Do you find that there’s a correlation between the drawings that you consider failed and a certain way that you feel? NF: Yes, I think so. It depends on why a drawing has failed, but oftentimes it’s because I wasn’t feeling steady or able to focus enough—or to slow down enough. RN: Are you trying to slow your life down enough to make each drawing, or do you make each drawing because you want to slow down? NF: I draw in order to slow myself down. The practice of drawing keeps me centered. We have gotten very busy, and I hope that I can bring a sense of slowing down to other areas of my life. I feel like the world we live in right now moves so quickly, and there are so many different directions to go in every day. I am truly blessed that my life is filled with a loving family, dear friends, and lots of fun, but I do treasure my studio time. My goal is to be present and attuned to whomever I am with and whatever I am doing. RN: Is there something about drawing daily that helps you? NF: Drawing is always better when it’s a daily practice. I take any window of time that I can. That time becomes sacred. The rituals of the practice help to quiet my mind. I’ve found that when drawing is a daily practice I have a good rhythm that creates a momentum. The work develops and evolves much more readily than it does if I’ve taken a break. But when I do take time off, I return with a greater appreciation for the practice. I see the work with fresh eyes. This new perspective brings a welcome shift. RN: Do you have a sense of how the patterns you make have evolved from earlier pieces to the present? NF: The very first patterns were the simplest, the most basic: one line touched the next line, and a field was made out of these lines touching. One day, I turned the paper ninety degrees and crossed over those lines, and a grid appeared. Every drawing since then has been another iteration, a variation on that idea: changing the spacing of the overlapping, changing the width of the line…. Each one comes after the next. I’ll see something happen in one drawing, and it’ll spark something I use in the next. RN: The patterns you develop are based on things you observe while making your drawings? NF: Yes, and while working things out on the test sheets. One drawing leads to the next as a natural progression. RN: Where do you see these patterns going, or do you feel that they have fully arrived? NF: Every time I feel that I’ve arrived, they evolve. Something shifts that takes me in a new direction. But at the same time, I feel like I’m doing the exact same thing I’ve always done—and that is one line after another. 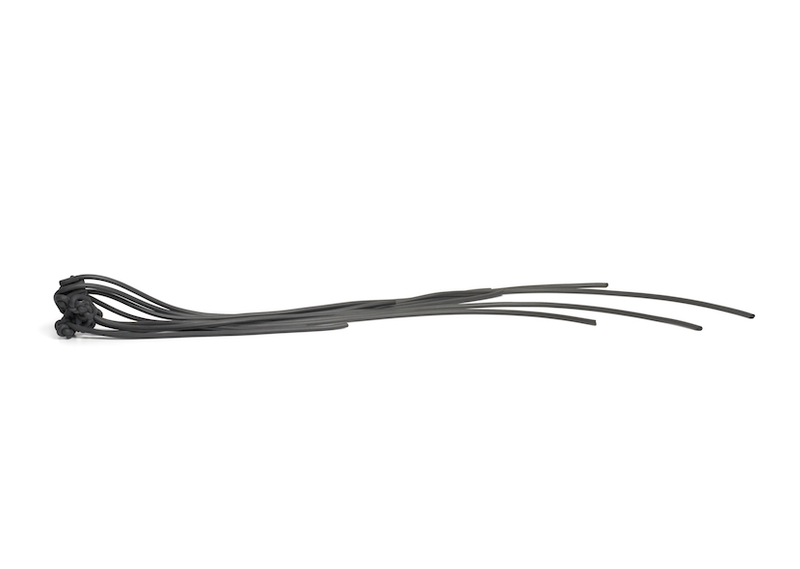 I do keep coming back to the simplest drawings, in which each line touches the edge of the previous line. Those drawings keep me grounded. They are the essence of my practice. So perhaps the very first one had fully arrived. Play to hear Nicole Phungrasamee Fein speaking about the “slowness” of her process in conversation with Wynn Kramarsky. Nicole Phungrasamee Fein (b. 1974, Evanston, Illinois) earned her BA and BFA from Tufts University, Medford, Massachusetts, and the School of the Museum of Fine Arts, Boston (1995-1996), and her MFA from Mills College in Oakland, California (2002). 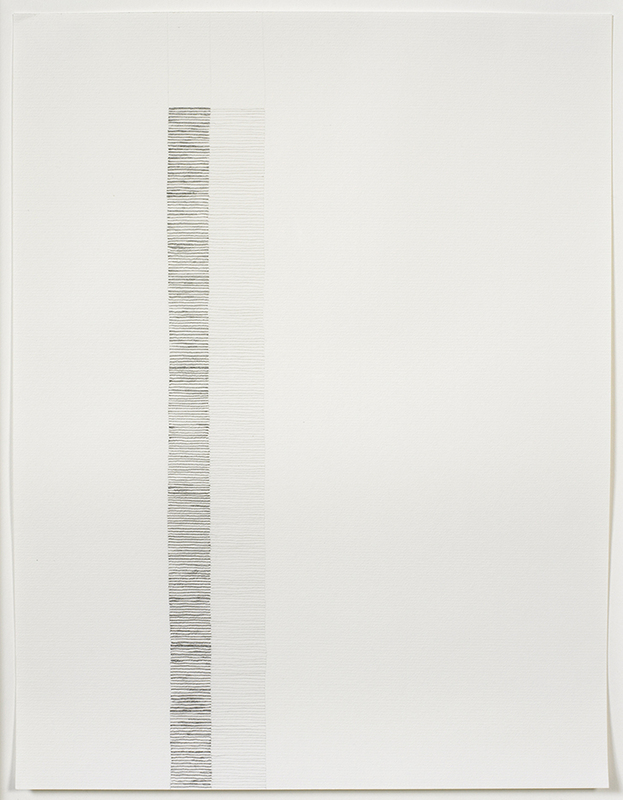 She is a San Francisco-based artist whose work focuses on the slow accumulation of lines. Fein’s work is in the permanent collections of the Whitney Museum of Art, New York; the Menil Collection, Houston, Texas; the Fine Arts Museums of San Francisco, Legion of Honor, California; the New Mexico Museum of Art, Santa Fe, New Mexico; the Hammer Museum, UCLA, Los Angeles, California; Harvard Art Museums, Cambridge, Massachusetts; and the Berkeley Art Museum, Berkeley, California, among others. She is currently represented by Danese Gallery (New York), Hosfelt Gallery (San Francisco), and Gallery Joe (Philadelphia).